Mark Simmonds takes us on a journey through the funding, finance and support landscape for Transition Enterprises and Social Enterprises. 2016 will be an interesting year for Transition Enterprises and social enterprise in general. There is a growth in the DIY sustainable enterprise culture as a response to climate change, a broken food system, a withdrawal of the state from community space and a general disenchantment with mainstream economics and the economies they create. We also have an ever growing community of practice – the enterprises that are emerging to fill this vacuum. They provide an inspiration and an example; catalysing replicants, adaptations and completely new ideas. Finally we have the emergence of many new forms of support available to these new and existing enterprises, to help them start and grow. Financial support – In the past grant funding in the voluntary, community and social enterprise (VCSE) world typically took the form of capital finance to buy things and revenue finance to fund workers in the early stages of a project. This was generally in the hope that when the funding ran out, the project would continue to operate having established a trading enterprise independent of grant funding. This funding was only given to organisations that were strictly not for profit. What actually happened was that the organisati on happily spent the money, bought the stuff, delivered the outcomes and then spent the last part of the funding to reinvent itself to apply for the next funding priority of the funders. Very few sustainable enterprises were created as a result. This type of funding is now much rarer. The focus more recently is to fund support or capital/revenue allied to support. The idea is that the grant funding is spent on the development work to create a sustainable trading enterprise that is “investment ready”. Any traditional grant element merely assists the process. Nowadays, capital finance is far more likely to be raised as part of the process from investors, be they social investors, social lenders or community investors. Below is an overview of the support currently available or about to become available and the trends emerging in the support landscape. The list is targetted at Transition Enterprise looking to start or grow and is not meant to be comprehensive. 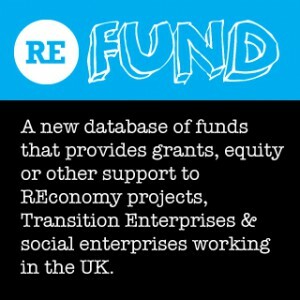 The REconomy project will shortly be producing a database of funds and support available to Transition Enterprise. A list of existing fund finding websites is given at the end of this blog. One of the few remaining examples of the traditional “get money to do nice thing” type of funding. It has however changed recently to allow the payment of wages and can be particularly useful for funding very early stage feasibility work, when you’re at a stage when other funders won’t look at you yet. They focus on projects that will impact on local communities, particularly around skills, health and the environment. There has recently been an increase in the funds offered by HLF, some of them aimed specifically at enterprise. These would be particularly suited to enterprise involving historic buildings or landscapes. They have specific funds for start-ups, heritage enterprise, parks, townscapes and places of worship. Power to Change is probably the biggest player in the “market” at the moment. Power to Change is an autonomous trust created by the Big Lottery with an endowment of £150 million, that they intend to spend over the next 10 years. Power to Change intends to grow the “Community Business” sector, defining community business as locally rooted, demonstrating community control and trading for the benefit of community. Power to Change will also be offering support around “blended funding”, using grant funding to unlock access to affordable loan finance. I suggest that you sign up to their newsletter at: http://www.thepowertochange.org.uk/ and/or follow @peoplesbiz on Twitter. Note: Power to Change support is England only. Big Potential, run by the Social Investment Business (SIB) is aimed at existing social enterprises looking to grow and provides up to £70,000 of grant funding to support organisations to become investment ready and develop their investment proposition. The funding pays for the time of approved business development providers and the time of the organisation. This support is particularly focussed on organisations that can demonstrate community benefit and who will undergo a journey of development as part of the process. Typical support includes governance and structure, marketing, business planning, financial planning and social impact strategy. Big Potential Breakthrough – providing support and grants to organisations who have not used investment before and are looking to raise up to £500k of repayable capital (the existing programme). Can provide up to £70K of support in two stages (£30K to develop business to investment readiness (or show that investment not possible) and a further £40K to develop investment product – share offer etc.). Big Potential Advanced – providing grants for more established organisations looking to raise in excess of £500k of investment or win contracts worth in excess of £1m (the new stream). Works as for Breakthrough. Note: Big Potential is England only. This is a UK wide lottery supported partnership that aims to support community growing enterprises to becoming more enterprising through novel funding approaches. They will deliver this through training and direct support. The project is in its early delivery stages and has regional advisors in place. Our Urban Shop is a new pilot project involving partners Plunkett Foundation, Locaility and the Esmee Fairbairn Foundation, providing grant funding of up to £30,000 to help communities to set up community owned retail enterprises. An EU programme that aims to provide funding for businesses and organisations looking to begin or expand their operations in rural areas. What separates it from other funding programmes is that it is delivered locally rather than nationally, with decisions on how and where the grant money is spent being made by an appointed Local Action Group (LAG) of key representatives from various organisations in the local area. There are several funds available to support the development of community energy enterprise, but this sector remains in limbo due to the expected slashing of the Feed in Tariffs. The Energy Saving Trust maintains an overview of funding and support for this sector: http://www.energysavingtrust.org.uk/organisations/funding-and-support. We continue to see the growth in crowdfunding for social enterprise. The REconomy Project have a slightly out of date blog overview here, but many are still current http://www.reconomy.org/top-40-platforms-for-crowdfunding-social-change/. 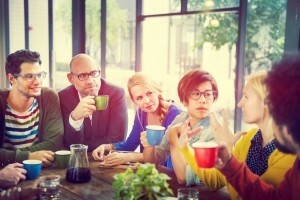 NESTA are also hosting a directory of crowdfunding sites: http://www.crowdingin.com/. One particularly interesting development from a Transtion/REconomy point of view is the rise of locally based crowdfunding initiatives, that facilitate place based crowdfunding. A good example of this is Crowdfun Bristol initiative, that has raised nearly £400,000 for 93 projects. http://www.crowdfunder.co.uk/campaign/bristol/. Another example is Spacehive https://www.spacehive.com/. The possibilities around financing local business support, transition enterprise networks and association with Local Entrepreneur Forums such as those run in Totnes and Brixton using these affiliate type relationships with crowdfunding platforms is particularly exciting – watch this space. Thy are paid by you the enterprise – this is unusual as those enterprises, especially in the start up phase, often don’t have the money. They are paid by a funder – the support of your enterprise is the outcome of their funder (Big Potential would be an example of this). They are paid by the investor – the support organisation helps you raise your finance and takes a cut to pay themselves. They don’t get paid – many support organisations will provide some amount of pro bono support or on-line resources in order to support those who have no way of paying, also secure in the knowledge that you may return to them when you do have a way to pay, for further support. A good support advisor will act as a critical friend enabling you to plan and create your enterprise rather than doing the work for you. They will also have an empathy with what you are doing and a knowledge of what else is already working. Finding someone to support you – there are directories of such organisations and often other enterprises can recommend the people they have worked with. Another approach is to go through an organisation that exists to provide support to the sector you are working in. For example the Plunkett Foundation supports community enterprises such as village shops and pubs and maintains a network of associates who may be able to work with you. With any of the above, you will find that if your initial approach isn’t to the right people, the support sector is very well networked and co-operative and they will signpost you to someone who is able to support you. Where a viable social enterprise can be evidenced, there are numerous sources of social investment as both debt and equity easily available. This investment is provided or brokered by Social Investment Finance Intermediaries (SIFI’s) offering many different financial “products” which open and close on a regular basis. The new REconomy Fund Database lists support and social funds that may be appropriate as investors (debt or equity) in any transition enterprise. This information was current in February 2016. Many of these funds operate as intermediaries for the £400M of funds brokered by Big Society Capital. Five SIFIs publish their expected return rates from investees, and these range from 5% to 15%, with simple loans at the lower end, and equity-type investments at the higher. Across the seven SIFIs we had information for, the average stated minimum interest rate for debt loans is 7%. Other reports (earlier) have anecdotal reports of slightly lower rates than this (around 4%). Thanks Mark. Great piece of research – very useful.